The United States and Cuba re-established diplomatic relationship on Monday after a gap of more than five decades, burying enmity between the Cold War foes. In the presence of hundreds of people, for the first time since 1961, the Cuban flag was raised at its embassy premises in Washington. The flag was also placed at the main lobby of the Foggy Bottom headquarters of the State Department. Similarly, the US flag was raised at the US interests section in Havana, officially making it the American embassy. "The US Secretary of State John Kerry will travel to Cuba later this summer to celebrate the re-opening of US embassy in Havana and raise the US flag," the US embassy in Havana said in its first official media release. 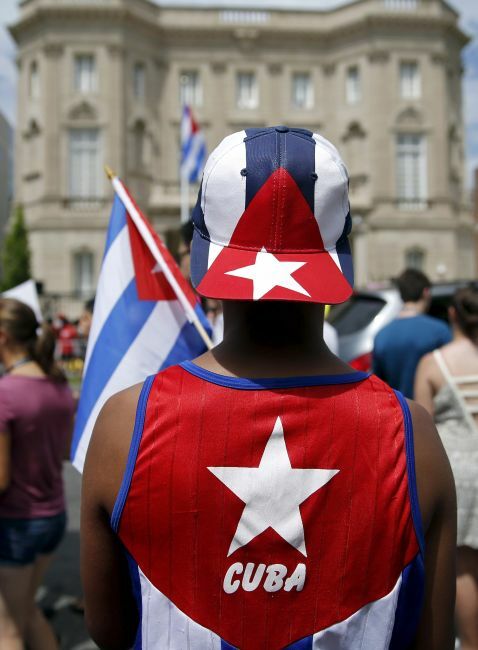 Kerry was scheduled to meet his Cuban counterpart in Washington later in the day. However, Senator Robert Menendez in a statement expressed deep concern with ongoing human rights violations in Cuba. "Diplomatic relations with the US are a privilege and must be earned, yet the Cuban government refuses to make any substantial changes to uphold democratic principles and human rights since the December 17th announcement," Menendez said. "With the opening of the Cuban embassy in Washington DC, the Obama administration continues to validate the Castro regime's brutal behaviour, doubling down on a one-sided deal that was not able to guarantee full staffing and freedom of movement for all diplomats required for a fully functioning embassy in Havana," he said. "There maybe a flag raising over the embassy of a dictatorship, but the real goal is a flag raising where the Cuban people are free, have their human rights respected and where we do not accept dictatorial conditions on our embassy and its people," Menendez said.